Hants + Links to Other Associated Entity Cases. …pictures which have been analyzed by experts, yet even they could not provide any logical explanation for such strange images. Originally taken in 1946, these photos were examined in more recent years by a photographer working for the Daily Mirror newspaper; this guy is a true professional, and still prefers to use old-school film cameras rather than digital, and he develops all of his own pictures in the traditional way; he concluded that my images were not the result of double exposure or chemical runs caused during processing, (as skeptics might try to dismiss them as) neither are they tricks of the light or anything similar; they are genuine, untouched and unexplainable. Yet it wasn't until the early spring of 1980, when it really hit me as to the true extent of my other-worldly visitations! The time was about 7.30pm, and I had just put our little daughter to bed; her name is Sally and she suffers from severe autism, so as the reader can imagine, I was now ready for a good rest myself; but, just as I was about to enter my lounge to switch on the television I had the shock of my life; nothing could have prepared me for what was about to transpire! 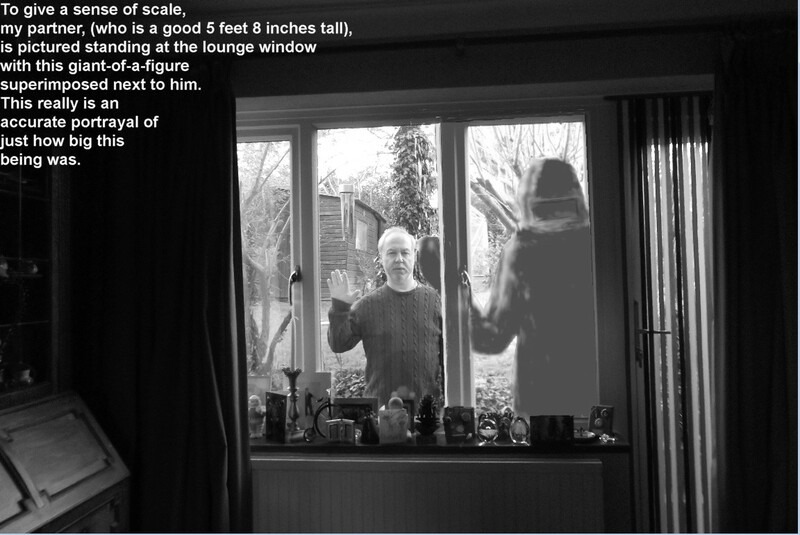 No sooner than I had opened the lounge door, I suddenly noticed a big figure standing there outside, practically pressed right up against my lounge window! Naturally, I was petrified, but also I wondered to myself how could he have got in? 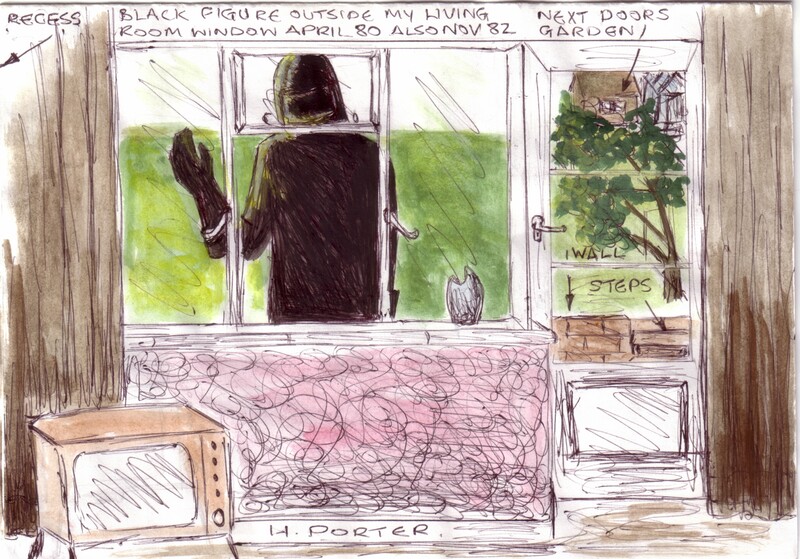 as we have high wooden fencing and bushes ¾ of the way round, and link wire fence divided gardens on the other side; then my thoughts turned to calling the police. This intruder was of absolutely huge stature, which I judged to be no less than 6ft 7ins high, (probably even slightly more than that) so tall in fact, that he was bending his head down into the fanlight window to peer into my room! I looked-on startled, terrified and yet outraged at the cheek of whoever/whatever this might have been. As I stared, I could see that the uninvited visitor was dressed in black from top to bottom, and had a helmet-type of head-covering with something like a large black visor on it; yet this 'helmet' seemed to blend into the suit somehow; it was very weird, almost as if it was an all-in-one suit of some kind. At this point the visitor raised his right hand. For some reason, I did the same and raised my right hand as if in reply. Next, this “being” suddenly moved, but without walking, (it was more like a sliding or floating action), …zooming backwards, (a good 5ft back) and up to my garden wall. Then the figure moved up on to the garden steps at least another 5ft to his left, …again without walking, as I didn’t notice any legs and the movements were truly super-humanly fast. Because of his huge stature he blocked out most of the view of my neighbors’ greenhouse and shed; and I noticed as 'he' stood there, that the sunlight was making a sheen on ‘his’ suit; but I had never seen anything quite like 'he' was ‘wearing’ before; nearest description would be a cross between a black space suit and welders overalls. Then to my shock, the visitor quickly vanished right before my eyes! I rapidly shut the curtains and began writing all that I had just experienced in my log book: Yet, rather than frighten me-off the whole subject of UFOs and aliens, once I had recovered, this encounter served to strengthen my interest further. …and 3 months after my man in black experience, I had a phone call from two nurses at High Hurlands Hospital, Passfield, Liphook, Hampshire. It was on a Sunday evening in July, time 9.45pm. The hospital sisters were so upset and distraught that they actually couldn’t speak much at first; but in between all of their crying I managed to reassure them - and told them to take as long as they wanted. Gradually they calmed down and started to relate exactly what was going on; they said that there had been many incidents where an unidentified, circular, humming craft with multi-coloured lights on it had hovered above their hospital and over the grounds nearby. Apparently they had observed it’s movements very well, and told me how the object always came from the Guildford direction then moved away southerly, towards the Portsmouth area; but they went on to say things have got much worse now. Just and hour or so before they phoned me, the craft had actually landed! Others in the staffing quarters at the bottom of the hill, had heard the humming of the craft and rushed out to have a look; they saw it hanging in the sky, and then suddenly it began to descend; at this point, the craft turned its lights off completely. With the craft having touched down in a field behind the apple orchard, one of the nurses went back inside and grabbed her camera and took several pictures; but because it was dark, the object distant and the camera only a very basic Instamatic-type, the images were useless... nothing came out. Then other staff coming off, and going on duty from the wards had reported seeing a large black figure rushing past their windows and doors. 'The whole place has been put into a lock-down situation', they told me. As with my own encounter, they said that the being doesn’t walk but just “moves at incredible speed”... zooming across long distances, such as up and down between the Hospital's apple orchard and buildings in the blink of an eye... which would normally take a person about 20 minutes to cover. Staff began phoning from the nursing quarters up to the main part of the hospital to warn them that the black figure was heading their way, and vice-versa. The nurses were so hysterical - I was barely able to get a word in edgeways at times; this, added to the fact that they were calling from a pay phone, (presumably located within their hospital) meant our conversation was very hurried and I didn't have the opportunity to tell them one of the most important things of all; that their description of the visitor in black exactly matched my own close encounter observations just 3 months before; or the remarkable coincidence that my daughter Sally is also a special needs child... just like the children at High Hurlands. I was taken aback by everything I had been told; then they begged me to go straight down to Liphook to investigate, but I explained that I had a small daughter to look after. I was on my own and couldn’t leave her, as she was also handicapped. As I waited for a call back, I thought hard on this situation; maybe those who are carers and nurses are being monitored by the aliens; perhaps these “beings” are studying the loving, caring side of humanity; or is it the handicapped children they are interested in? it's funny the things that go across your mind, especially in a time of crisis. Anyway, Omar Fowler phoned me back and agreed to take the hospital case on; and so I left it in his very 'capable' hands. Things seemed to go quiet for a while, then, one rainy evening, in late November 82, the alien/paranormal visitor came to our house again! And this time I had a witness, my friend Beverly who was playing with my daughter Sally in the lounge! 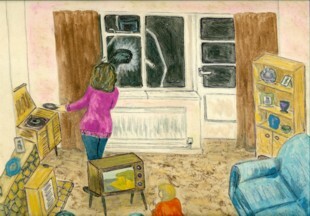 Bev was in the alcove to the side of the curtains putting a record on the radiogram, and my daughter was lying on the floor watching the TV. Suddenly there were several loud bangs on the window pain, and my friend stepped back to see who on earth this could it be. She told me that 'it' was dressed all in black with a helmet on and a huge black gauntlet-covered hand. At no time could I reveal what really took place, as the police would have thought us both barmy! I never heard from, or was able to contact, or trace the nurses at High Hurlands again; whether Omar had something to them, whether they were warned off, or had moved on - or were simply too scared to discuss the matter anymore, I simply don't know: All I do know is that despite the passing of several decades, whenever I'm in my lounge, I sit with the curtains open in the evening, wondering whether the being in black might return again someday. 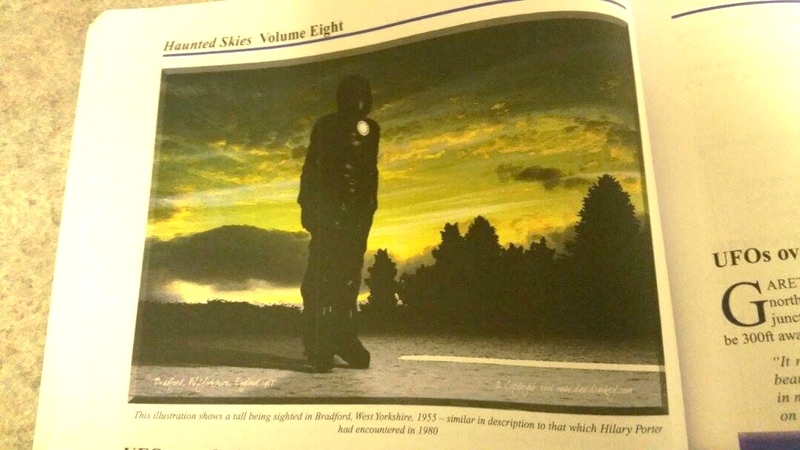 The above experiences have strong similarities with yet another case, where a large black alien entity was encountered in Bradford, UK, way back in 1955. 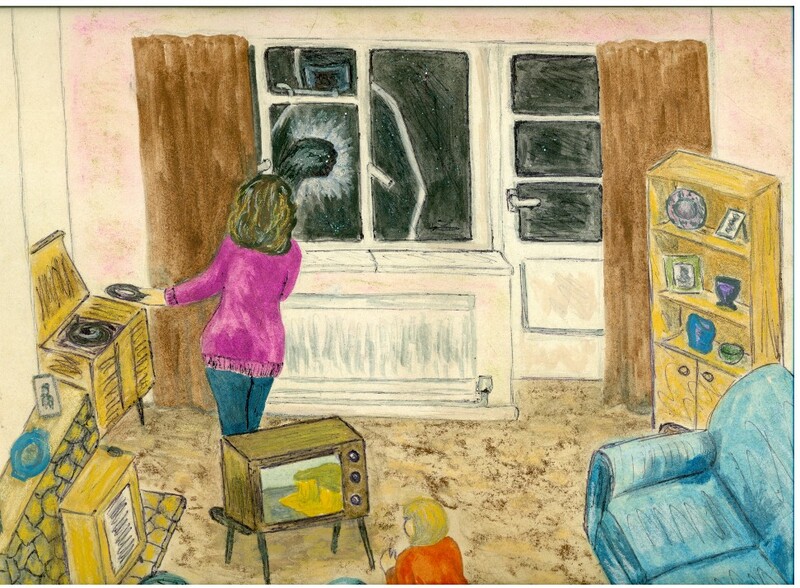 Please click here to view an illustration from Vol 8 of the excellent set of books entitled Haunted Skies - by former Police Officer John Hanson and his partner Dawn Holloway. Video: 2014 Lecture concerning these cases - given by Hilary at the Probe Conference, St Annes, Blackpool, Lancs. Also, this is worth reading; please click these words to open an important Canadian report, which has a few similarities with the cases we have outlined here.